I really admire Andrew Smith’s set-up here. It’s all done in the dialogue of course, but it’s so well done that you can picture the pan and zoom from the Large Magellanic Cloud to Gallius Ultima. And doesn’t Gallius Ultima sound like something you’d find in the Golden Age SF novels of EE Doc Smith or Asimov? Exactly. The fact that one of the starships is named the Carl Sagan only adds to the geek value and proper space opera-ness of it all. This all fits in very well indeed with the Fifth Doctor’s TV era, with the same tone as the Lost Story The Elite in some respects. Obviously with a large Tardis team it must be split up quickly. Rarely does this result in half the crew being stranded an entire galaxy away, but Smith does this with aplomb and then takes it even further. The Star Men of the title aren’t from E-Space, but their own universe has been exhausted by their hunger. They’re dangerous enough that even though you know that the team has to survive, you’re still worried that Smith might rip up the rulebook completely. And what to make of Adric’s debut in the Main Range? It’s not as jarring as Psychodrome and Iterations of I, where Matthew Waterhouse struggled to refind Adric’s voice. He sounds a lot more comfortable, massively enjoying himself, and the role he’s been given in this play at least is a very meaty one – plenty of opportunity to examine his character and refine aspects of Adric’s personality. 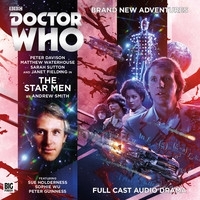 I’m biased here as I’ve enjoyed the vast majority of the Fifth Doctor’s adventures, and listening to this after a hard slog through Sly Seven’s catalogue is a pleasure. But this is Doctor Who as it was, and as it should be.